I have an entertaining album to share with you from Hullabaloo! I Chew features songs that will bring a smile to your face as you sing along to the silly lyrics. The music is light and very easy to listen to (a plus to this sleep deprived momma!) - think country rock. Hullabaloo has made a career of creating "a foot-stomping, wing-flapping celebration of song that both honors and entertains kids and families." Noteworthy on I Chew is the song "I Wear Pink," which is all about allowing children the freedom to be themselves. "I Wear Pink" is based on Steve Denyes' real-life experience as a boy who mostly learned about life playing with his older sisters and other kids in his neighborhood who happened to be girls. Predictably, he wound up wearing a lot of pink and playing with dolls, that is, when he wasn't surfing, skateboarding, and playing soccer and basketball with one of his best friends, Eileen, the neighborhood tomboy. Guest artists heard on "I Wear Pink" include kindie music luminaries Peter Alsop, Jim Cosgrove, Papa Crow, Laura Doherty, Dean Jones, The Singing Lizard, Red Yarn, Randy Kaplan, Pointed Man Band, and Mista Cookie Jar. 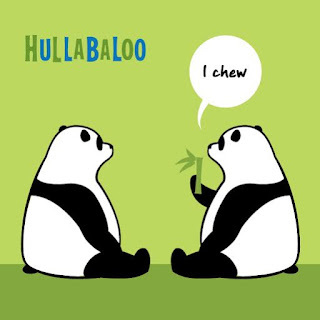 I Chew will be available at hullabalooband.com, CDbaby.com, and iTunes. Visit the Hullabaloo website HERE. Did Hullabaloo meet my five year old? I swear he collaborated on the song I Can't Let It Go. Sounds just like my kid. This whole album is just so enjoyable. I've loved the song Senator John Arthur Clydesdale III - which is fitting for all the election talk in our house. Several songs like I Wear Pink and Flowers On My Shirt are great for reminding kids they can be whoever they want to be. Having four boys in my home I appreciated both of these. Our oldest has always loved the color purple and all of my kids had a dolly they played with. The merry lyrics are all very catchy - you'll find yourself singing along! One lucky reader will win a copy of I CHEW from Hullabaloo! I learned there is to be a Hullabaloo Family Music Festival on April 30th. I learned that Steve Denyes and Brendan Kremer have been friends since kindergarten. At last count, they’d sold just over 30,000 CDs.